An awesome lodge with professional and courteous staff..not to mention, great hunting! Best hunting lodge ever. Had a great time. Hayward and his staff are the best. Killed my first deer there. Hayward,Billy and Red Dog . The best !! Be back in a few weeks. Since 1985, it has been the goal of the Cedar Knoll Hunting Lodge to provide the best when it comes to deer hunting in South Carolina. Located near the Savannah River south of Fairfax, South Carolina in the beautiful South Carolina Lowcountry, our lodge is the ideal spot for those looking for deer hunts From August 15th through January 1st. Are you interested in deer, wild boar, or hog hunting in South Carolina? If so, welcome to Cedar Knoll Hunting Lodge! We are located in the beautiful Savannah River basin, prime deer and wild boar country. At our lodge, we offer a guaranteed South Carolina deer and hog hunting experience; if we do not produce a number of shooting opportunities at suitable animals equal to the number of hunters on hand during your visit, you come back at the “Non-Hunter” rate of $150.00 per day which covers food and lodging only. Our goal is to provide you with a world class experience on a trip you'll never forget. Whether this is your first guided hunting trip or you are on the search for your latest trophy, the staff at Cedar Knoll can help you achieve your goal. 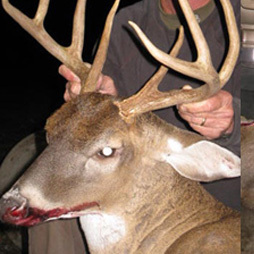 In fact, regardless of your level of expertise, you can rest assured that the guides at our hunting lodge are the best in South Carolina when it comes to putting you in a position to harvest deer and wild hogs. Just round up a group of your hunting buddies and plan a trip to Cedar Knoll to experience the best southern hunting scenario. In addition highest success rates in the region, we also offer comfortable, fully furnished facilities, and delicious food to further assure that your experience will be one to remember for years to come. You deserve the very best. When you and your friends are planning to go deer hunting in South Carolina, let the staff at Cedar Knoll advise you. Since opening our hunting lodge in South Carolina in 1985, we have been the nation's leader in the advancement of white tailed deer and wild hog management strategies and advanced deer and wild boar hunting techniques. With our hands-on guidance and support, you'll be in a position to take advantage of the best opportunity for success in the region. For more information on our convenient and affordable packages or to ask questions about hunting in South Carolina, call to speak with a member of our staff today. We offer a number of options that are sure to meet your needs. Contact the staff at our hunting lodge in South Carolina to learn about our program options. We offer our hunting services throughout the country, but are especially suited to folks along the I-95 corridor including those from Florida, North Carolina, Virginia, Pennsylvania, Maryland, Massachusetts, New York and Vermont.